From our esteemed military members and their families to our cherished senior community, we’ve created specials that will make their stay with us affordable and rewarding. We want everyone to have the opportunity to sample our riverfront hotel near downtown Cincinnati, and see all it has to offer. Crowd of fans cheering in a stadium. Stay close to your goal & save up to 15% off your stay PLUS earn 1000 bonus points per night you stay! Support your favorite teams and artists this spring and treat yourself to a relaxing grand finale in one of our modern, contemporary suites! 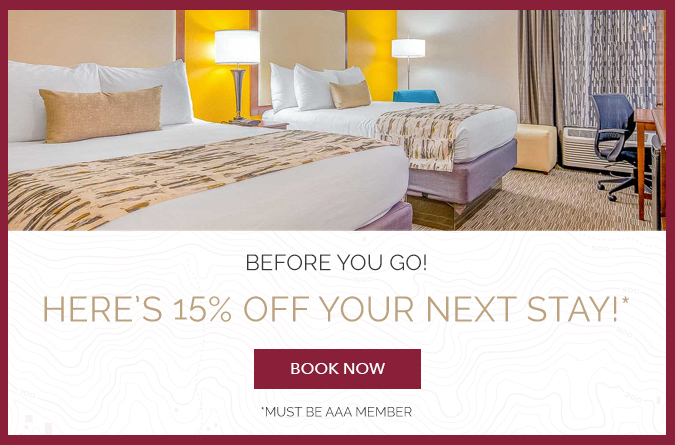 Whether your road trip takes you to Cincinnati’s riverfront for a stay with us or the rugged coastlines of the Pacific Northwest, your AAA card will earn you a discount on room rates. We honor veterans, military members and government personnel with a discount off the flexible rate at Best Western® Hotels & Resorts throughout North America. Best Western® is pleased to offer AARP® members and guests 55 and over a discount on room rates.